Machine WDM-3A-B-CL800-NP designed for THE AUTOMATIC DE-BURRING UNDER SPOKE AREA and front face (13"-20"or 22"). 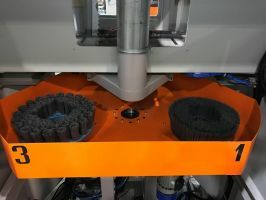 THE machine is equipped with three brushes so as to cover the widest possible wheel diameter range without changing the brush as for the standard single machines. THE machine flexibility is further enhanced by the possibility to replace The brush in few seconds without stopping the de-burring cycle.